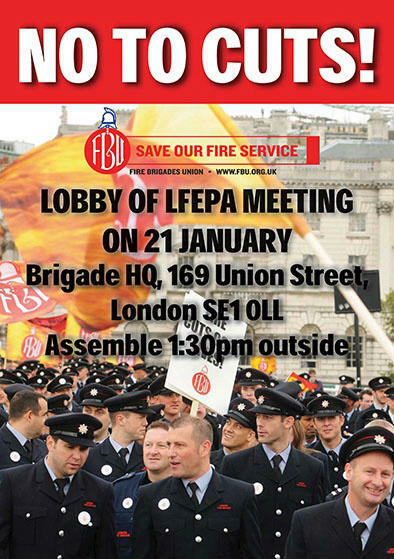 We urge everyone who can to attend this major London FBU rally just 10-15 minutes walk from London Bridge station. Speakers at the rally will include Matt Wrack (FBU), Bob Crow (RMT), Mark Serwotka (PCS), Kate Hoey (Labour MP for Vauxhall) & Andrew Dismore (London Assembly Member). Protest at reckless cuts being proposed by Tory Mayor Boris Johnson, who wants to close 12 fire stations, scrap 18 more fire appliances from other stations and sack 520 staff. These cuts will dramatically affect the safety of everyone who works in, visits, or passes through London. The first crew on the scene of the Vauxhall helicopter crash this week was from Clapham Fire Station, one of the 12 Boris wants to close. Westminster Fire Station, which attended both the Vauxhall helicopter crash and the Victoria train fire the next day, is another of the 12 on the Boris hit-list. Given the huge numbers of people who commute into London from the South East, these cuts inevitably put people from Sussex at greater risk. Supporters from Brighton & Hove will meet at Brighton station at 11.30am and travel up to London on the 12.04 Thameslink service, which arrives at London Bridge at 1pm. Brighton & Hove Labour Party has agreed to send its banner to the rally and we hope to see other Sussex labour movement banners at this event.